This post is going to be biased. Sorry. I’m a big fan boy of David Meerman Scott dating back to his (in my opinion) classic book The New Rules of Marketing and PR. I read that book in 2008 and it rocked my world. 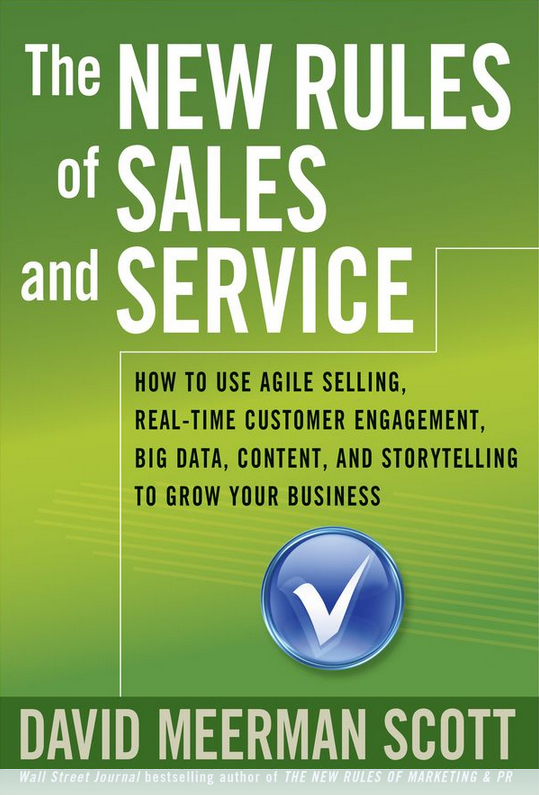 Now he’s got a new book focused on sales, The New Rules of Sales and Service. David pretty much defined content marketing about the same time Hubspot were thinking that way and now Hubspot is a newly-minted public company. He was the keynote speaker at Hubspot’s first Inbound conference. A couple of weeks ago I went to the 2014 version of Inbound with about 10,000 other people and was thrilled to not only attend David’s talk but get him to do an interview about his new book and his thoughts on social selling. Here’s top 5 points from that interview. Some of these points may seriously imact your sales career. 1. Sales people need to make a choice. Ouch! David says we are halfway through a 40-year revolution brought on by the Internet. He says in the future people will look back at this time period and see it as the era of massive change, something like the industrial revolution. He believes companies and sales people need to wake up to the fact that buyers are now in control of the purchasing process and act accordingly. One upshot of that is that he sees sales people as having to become providers of useful content as a means to being found and as a way to be always be helpful to prospects and buyers. I asked David what a sales person should do in a company that has not yet embraced these new behaviors (social selling). For example, a company that still insists on cold calling and judges reps by the number of calls made per day etc. Sound familiar? (1) Don’t do anything. Knuckle down to how things are and keep your head down. You won’t be great in this new world of buyer-lead sales but maybe you’ll keep your job. (2) Become the agent of change. Try to move your company to the new sales model. This is very risky but you will be doing the right thing for company and yourself in the long run—but you may lose your job as you will be “fighting the system”. Changing existing companies is bloody hard (OK, David said “very very hard”). It’s easier for a brand new startup to establish its sales and marketing processes the right way, changing existing processes and structures even just a little is really hard. David points out the main champions of the sales status quo are your sales managers. Most sales managers, directors and VPs came up through the ranks. They were once top sales people. They figured out what worked in selling. They want that stuff repeated by their reps today. Here’s the problem: times have changed. Buyers have changed. Selling has changed. And many sales managers have NOT changed. They want things done the “right way” from what they know. Unfortunately what was right when they sold is now wrong. CRM is the second biggest problem. Up to this point most CRM systems really just help sales managers get reports. What they don’t do is help sales people sell. The reporting and structure of these CRM’s is based on the traditional way of selling, e.g. how many cold calls did you make today. These CRM’s have old sales processes “baked” into them, encouraging you to sell the old way. This point actually is etched into my mind. I may go on about this a lot in future posts here. David states that every company needs at least one “customer expert”. He believes the customer expert should probably reside in the marketing department. Marketing people should dedicate themselves as a primary job function to understanding their buyers—in a lot of detail. They should spend plenty of time and effort researching your buyers needs, behaviors, mindset etc. What’s so eye opening for me about this is that now I realize that so many of the revenue problems I’ve had over the last 20 years of sales and marketing really started by not understanding our buyers well enough. You can be amazing at sales (or marketing) but unless you intimately understand your buyers you’re going to run uphill forever. I’ll stop for now on this point but it’s so fundamental that I recommend writing it on a Post-It note and affixing it to your monitor or getting a tatt. David’s recommendation is that you become a content curator (rather than a content developer). This means you don’t need to spend hours writing blog posts and ebooks. What you do need to do is go find great blog posts and ebooks that other people have written and then send these links to your prospects and clients. Content curation is pretty much what I’ve done for the last 10 years with Sales 2.0 and I can attest that it works. People associate the value they are getting with the sender not just the author, so this approach seems to make total sense to me. You may think David Meerman Scott is off his rocker with some of these suggestions but I believe he’s spot on. It’s tough to bet against him. Just about everything he wrote in the “New Rules of Marketing & PR” 7 years ago are now standard operating procedure for marketers. It seems quite likely he can see the future of professional sales too. I’d bet on it! 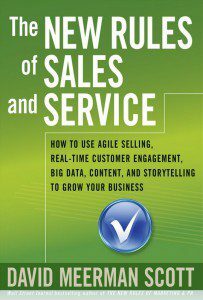 Should you want to see the future of your sales career, I highly recommend picking up a copy of his book on Amazon here. It’s a fun read and cheaper than a crystal ball. Or check out David’s Slideshare below. I’m so glad we met at Inbound. It’s great to spend time with a like-minded evangelist for the new ways to sell. I love how you organized our interview. Many thanks for taking the time to talk with me and write this up. I’ve already tweeted it and will be pointing others to it. Great way to explain the concepts like this. Without sales, no company in the world would exist. Without income through deals, no organization has the open door for development. Sales is a great field to start your career with.